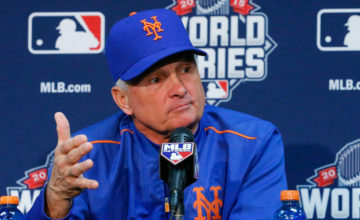 Before the Mets took on the Cardinals yesterday afternoon, Terry Collins spoke to reporters about the recent string of Mets injuries. It’s not news that Collins was unhappy about his guys getting hurt, but it was surprising to hear just how frustrated and even angry he was when asked about Ruben Tejada’s groin strain. While it can’t be a good sign that Collins is already bent out of shape before a potentially disappointing season actually starts, I like that the fans are not the only ones upset that the Mets cannot stay on the field. To compete this season, the Mets are going to need to take advantage of every little edge they can gain (and probably get lucky as well). How are they supposed to do that when they don’t have the desire to be on the field everyday? 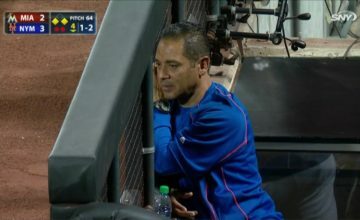 Maybe Tejada is more seriously hurt than Collins lets on and maybe he isn’t. 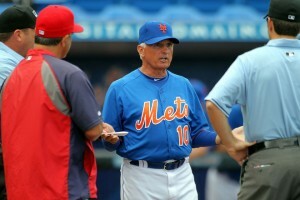 Either way, its a bit disappointing to see Tejada seemingly take his opportunity to start at shortstop for granted. Hopefully minor injuries won’t keep him from playing in any regular season games. In the Mets 7-1 loss to St. Louis at Digital Domain Park yesterday, Mike Pelfrey pitched 4.1 innings while allowing 6 hits and 4 runs. He recorded no walks, but no strikeouts either. In Matt Cerrone’s account of Pelfrey’s start, he seems unsure of exactly what the big guy was trying to do on the mound. Pelfrey’s sinker looks flat today. The thing is, that would be OK from time to time, if he changed speeds more and used more breaking pitches. However, he isn’t doing that any more. And so, I just can’t figure out his strategy. The non-sinking sinker allowed the Cardinals to hit a pair of home runs against Pelfrey. Always the optimist, Cerrone does offer that Pelf was terrible in March 2010 before starting the regular season 10-2 with a 2.71 ERA. On offense in that game, the Mets obviously did not have much going on. Daniel Murphy was 2 for 4 with a pair of singles, Jason Bay went 1 for 3 with a double and Lucas Duda was 0 for 1 with a sac fly to plate the only Mets run. Pedro Beato, who has been out for more than a week with right rotator cuff inflammation, will begin throwing tomorrow. Ruben Tejada will take groundballs today. David Wright’s injury is a tear in his six pack, probably because he worked out too hard with The Situation last spring. He says he should be all set for Opening Day. Please let that be the case. Dillon Gee will start for the Mets. Max Scherzer takes the hill for Detroit. The Mets are starting mostly reserves and minor leaguers with the possible exception of Daniel Murphy, while Detroit’s lineup is loaded with regulars, so the Mets will probably lose today. But that’s why they play the games. 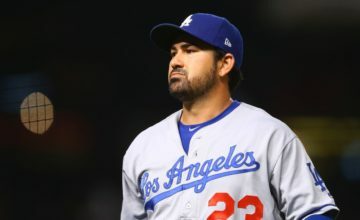 POLL: Adrian Gonzalez vs. Lucas Duda – Did Sandy Make The Right Choice? Terry Collins as Mets Manager: A Success or Failure?